In what is being seen as a heartening sign of hope for a species that was once within a hair's breadth of being wiped out entirely, a pair of California condors have been observed raising a chick in Utah's Zion National Park -- part of their once-expansive range but where they hadn't been seen in generations. 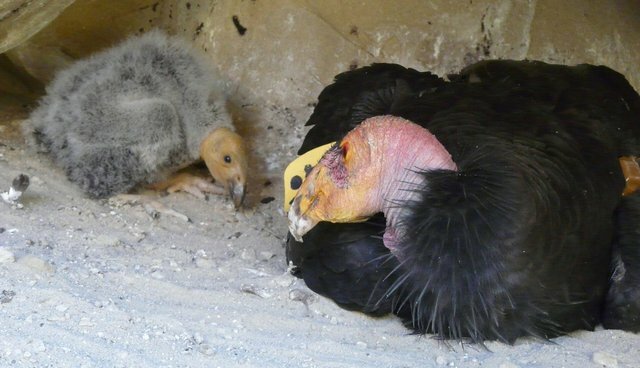 "This is the first documented occurrence of California condors raising a chick in Utah," says Eddie Feltes of the bird conservation group The Peregrine Fund. Condors were once common throughout the western United States, but after more than a century of poaching, poisoning, and exposure to pollution, the species slipped into dramatic decline. By 1987, when a recovery plan was put in place to help stave off their extinction, only 22 of these birds remained. Since then, captive breeding programs have helped bolster their numbers, and selective release back into the wild has begun to see them gain a hold once again in their native habitat. Today, there still only 213 condors in existence in the wild, which makes each new birth a cause for celebration.